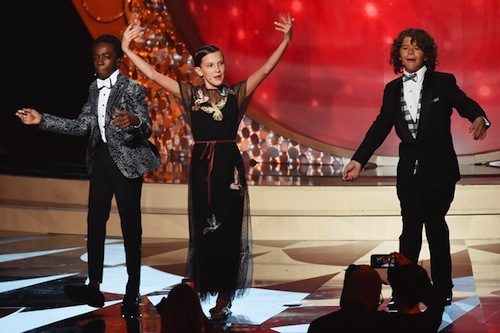 The kids from Stranger Things performed at the Emmys pre-show last Sunday! Millie Bobby Brown, Caleb McLaughlin, and Gaten Matarazzo warmed up the crowd with an electrifying performance of Mark Ronson and Bruno Mars' hit Uptown Funk. Thanks to Netflix and Jimmy Kimmel Live the video is now available to watch. Can these great guys do no wrong? Of course not. Don't miss their appearance on Chelsea. You can read my spoiler-free review of the Duffer brothers Stranger Things here. The series is currently streaming on Netflix.